Have managed to knock off a few jobs to do with the aquaponics over the past week or so and Thought Id share them with you all. I was asked if I could film a clip the next time I harvested some Jade perch from the aquaponics so folks could see how we do it here. I know it can be a bit daunting for new comers to aquaponics so I hope this helps you folks out. Have added in a quick look at some meals we make with the perch at the end of the clip for those that are curious. Hopefully we'll have some free time next weekend to separate the silver perch between the 2 tanks. Am looking forward to trying them to see how they compare to the Jade perch. A few of the plants in the grow beds have gotten a bit unruly lately, so I decided they needed to be cut back a bit. All didn't go to plan but am happy with the results. Also planted out some seedlings to fill in some of the gaps the clean out created. Was hoping to sow out a few seeds this week but that wasn't to be. Will pop in a few Asian Greens as well as a few other seedlings through the week I think. I hope you found how we harvest and process the fish interesting and enjoyed the look at some of the maintenance that was done. Feel free to share the clips if you found them helpful and you can also check out our YouTube home page for other useful Aquaponic and Backyard Farming playlists. Hi Folks. I set about harvesting the volunteer Purple Congo Potatoes and turmeric from one of our polyculture wicking beds. What makes this harvest a bit of a bonus is that both plants are volunteers that have grown fairly well with little to no attention from us. Have included a look inside the cooked spuds at the end & how some were used to make a potato salad. Hi folks. Here's a look at our Home made Asian style chicken soup using home grown veggies & spice. Its a great recipe as you can adapt it to fit whatever veggies or flavourings you have on hand. It's very popular with the family & is made quite regularly here. We also use a similar base to make up our "Short Soup" with home made wontons. Feel free to share it along if you think others might like to have a crack at cooking some up. This one is an overview on how the patch and aquaponics is going now we’re almost in the middle of winter here in subtropical SE Queensland Australia. I think doing these video updates will help to keep me focused on the larger picture so am looking forward to getting back into them. Will be keeping future update clips a bit shorter but wanted to give an over view to kick things off. 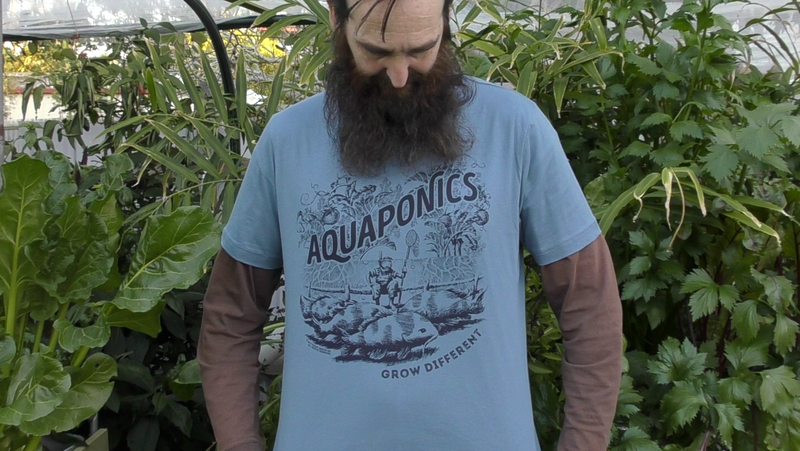 Received a beauty of a pH meter from Bluelab and an AWESOME "Aquaponic, Grow Different" T Shirt from Root and Ramble and thought I'd give you folks a bit of a look. Just a quick heads up, Root and Ramble were kind enough to offer a 15% discount code to our YouTube and social media audience which will be valid until August 1st 2016. It's not just on this T but on all goods. Hope all your gardens are booming along and I'll catch you later. Thought it was about time a post was made on the original design we came up for the block here. This was the design I submitted to the online Permaculture design course run by Geoff Lawton in 2015. 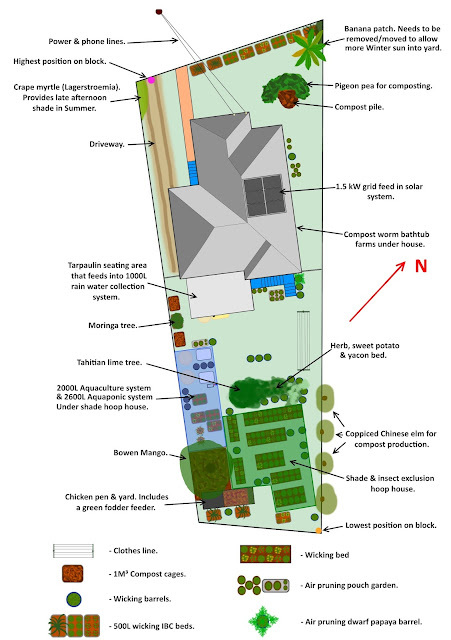 Probably not the best example of a Permaculture design but thought it would help give folks some idea on what we have planed for the site here. I have included a video below the design that has a full walk through of the block as it stands today if you want to see what it looks like now before too much work has been carried out. 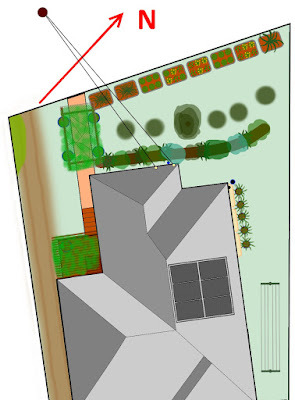 Permaculture Design Plan for "Bits Out the Back"
This North Ipswich property is home to a family of four that have a keen interest in growing as much food (fruit, veggies and animal protein) as possible and practical on an average urban block. The site is a 680m² urban house block located in North Ipswich, SE Queensland Australia (27°36'12.14"S - 152°45'52.36"E). Highest position on block is 28M and the lowest is just over 24M above sea level. 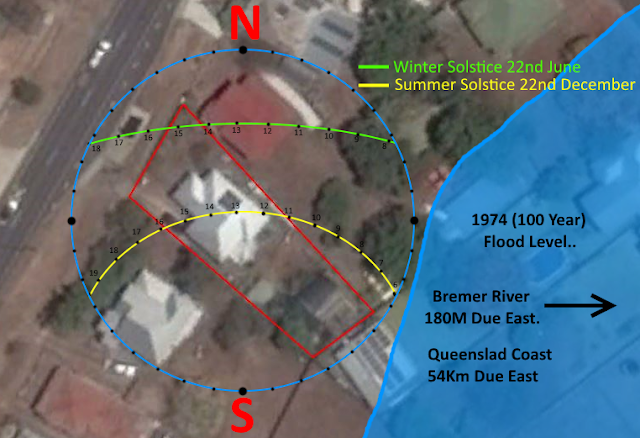 The block is orientated NW to SE with an average slope of 6.6%. Ipswich is considered to have a subtropical climate with average Summer temperature ranges of 19.2-30.8°C (65.6 – 87.44°F) with a maximum sun angle of 85.75°. The average Winter temperature range is 6.2 – 21.8°C (43.2 – 71.24°F) with a maximum sun angle of 38.9°. The average rain fall is 854mm/33.6”, the majority of which falls between November through to May. The majority of rain events come in from the NW to SSW, with the Summer afternoon thunderstorms coming from W to SSW. The prevailing winds are generally from the West in the mornings, with a swing to the East in the mid to late afternoon. Most of the history of this property comes from talks with an elderly neighbour whose family has lived in Ipswich since the early 1900’s. The property was once part of a farm dating back to the late 1800’s that was progressively broken up in to smaller lots. Land just to the south east of the property was once used as a refuse tip by local residents during the late 18 and early 1900’s. The blocks were terraced off using soil from the refuse site leading to large amounts of fragmented solid waste being deposited in the top soil. The current residents have unearthed such “relics” as old cutlery, a penknife, crushed food tins, medicine bottles, fuel tins, many pieces of broken glass, ceramic stone wear and china. The house is a timber weatherboard on concrete stumps that was built in the mid 1950’s and was purchased by the current owners in 2002. It had several small ornamental gardens installed in the front yard. 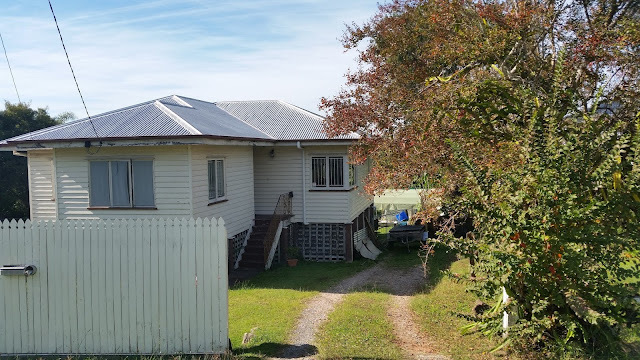 One ran the length of the front fence, 2 ran either side of the front path leading to the house and the fourth was a small square bed in the centre of the yard, all of which were in disrepair when the current residents moved in. The backyard contained 3 mango trees and numerous Chinese elm trees that ran the length of both sides of the property. The 2 stringy/turpentine mangoes were removed along with all but 4 Chinese elm trees which are being coppiced and used to make compost since. All current gardens, chicken pen/yard and aquaculture systems have been constructed over the past 6 years. The main focus of this design is on the rear yard of the property with a few changes/additions being carried out in the front yard. A better utilisation of natural energy resources, in particular rain water collection and solar energy. Become self reliant in compost/vermicompost creation via organic material grown or collected on site. Enhancement of onsite soils through various composting and mulching methods. Inclusion of more perennial food producing plants. Inclusion of more flowering/beneficial bug attracting plants and herbs. Encourage more native wildlife into yard including the addition of a native bee hive to help in pollination. Providing space for the education of others in the production of food/resources through open days and workshops. Increase the available yield with the intention of on selling excess to supplement income. 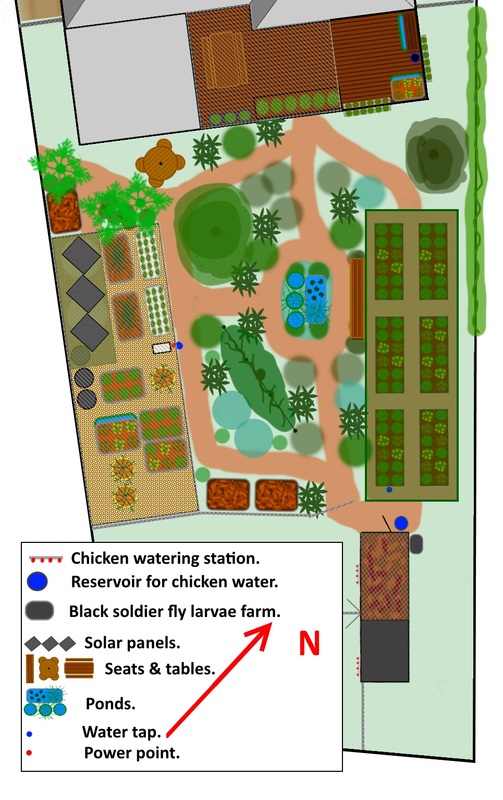 Substantial inroads have already been made towards these ends with a number of vegetable beds, a few fruit bearing perennial plants, aquaponic system, aquaculture system and egg laying chickens already on site. Not all of the elements are in their optimal positions so a redesign is called for. Some elements will need to be removed or relocated with new elements added to help increase the yield potential and functionality of the property. As mentioned above, extra top soil was brought in many decades ago to help terrace the property and as a result is deeper at the rear of the block. This sample of soil was taken from the centre of the back yard lawn, where the majority of the new plants will be situated. It was tested for pH using a chemical test and came back with a reading of 6.5. All other samples taken were between 6-7. The soil sample was given the “Jar” test and the results indicate that the soil is a silty/loam with very little clay or organic matter present. The soil around the existing lime tree and herb bed suggests that both earth and compost worms are present in healthy numbers which will help condition the soil around the new plantings. Numerous varieties of mushrooms also appear after rain events indicating mycelium are present in the soil. One concern is the level of lead that has been deposited in the soil close to the house. 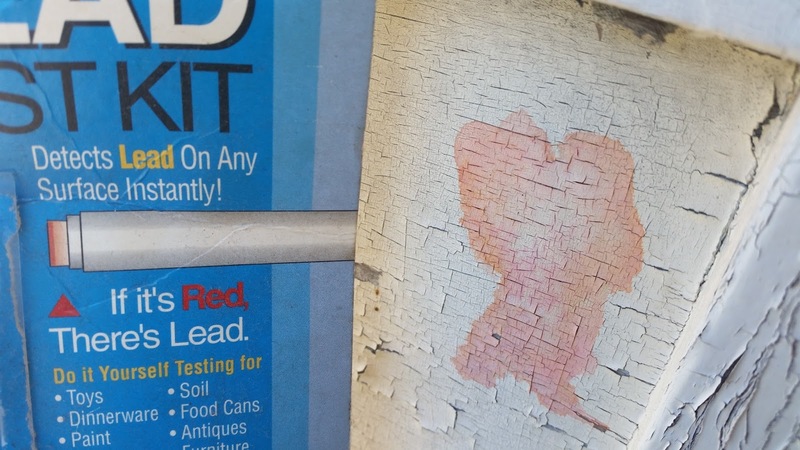 A DIY swab test has been carried out to confirm the use of lead paint on the house itself but no testing has been carried out to find out at what levels are present in the soils due to flaking as of yet. Due to this no food plants have been grown in this soil near the house. It has been suggested that a comprehensive soil test be carried out on the soil surrounding before leafy greens and root crops are planted out. Many of these will be used to propagate new plants for the proposed plan. Owners also have an extensive seed library and are members of various plant/seed sharing and trading groups. Owners are restricted in the number of poultry that are allowed on the property so have ventured into aquaculture to help provide animal protein on site. Various resources have been accumulated and stored on the property for later use. The majority of the property has been designated Zone 1 due to the elements it contains and as it will be visited a minimum of once a day to feed animals and harvest food. A small zone 2 food forest has been incorporated at the rear of the property. Remove and compost banana clump in front right corner after propagation material has been collected. This will allow more Winter sun to enter the front of the property. Plant a row of blueberries and a dwarf fig tree across the centre of the front yard. Compatible understory plants to be included under these trees. Build an arbour across front path, planted out with grape vines. Wicking barrels will also be situated under arbour for other climbing annual crops such as beans and sweet potato. Construction of a swale on contour across front of yard to collect and soak water. This will also help alleviate the flow through and washouts under the house during heavy Summer rain events. The swale will only be planted out with edibles if lead test comes back clear, if not it will be planted out with bird and bug attracting ornamentals. A small front deck to be added with an open rafter roof containing a small trap door. This will allow easy access to the roof for solar panels and roof maintenance. Deciduous vines will be grown over the rafters to provide afternoon shade from the Summer sun to living areas of the house. 3 slim line 2500L tanks will be hooked up in series to give 7500L/1980gal (US) of water storage capacity. Water from these tanks will be used to supply the washing machine and planned down stairs toilet via gravity. Pineapples will be located next to water tanks. They will be grown in air pruning pouches raised off the ground and irrigated via Wetpots. The clothes line will be moved to the NE side of the house to free up growing space in the back yard. In this position it will still receive 6+ hours of sun a day during Winter. Existing wicking IBC beds may be clad with reclaimed pallet timber as it becomes available to help protect them from UV degradation. The residents will be building in under the house to provide extra office, kitchen, bathroom and communal workspace. An upstairs extension is also planned to increase the family living area with an extra room and a semi covered deck. Two rain water tanks will be housed under the deck on the NE side. The open space on the SW will be paved with reclaimed bricks from the current garden and used as a communal workspace/entertainment area. The deck itself will be home to a 1200L/320gal (US) aquaponic system used to grow culinary herbs, greens, salad tomatoes and strawberry plants. It will also serve as an outside living/entertaining space. Redirection of water flow from the driveway has been taken into consideration. It shall be redirected, slowed and soaked using the raised wood mulch paths. The final redirection of surface storm water will be addressed upon completion of the renovations. Removal of current hoop house, wicking beds and barrels. Inclusion of a wood chip path linking different elements allowing surface water to slow and soak into the ground. Ponds to be added for both wildlife and edible water plants. 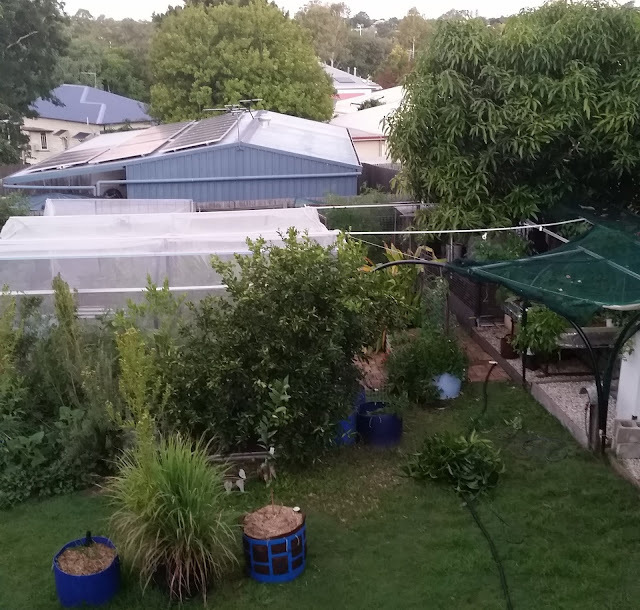 Pergola to replace current shade structure over aquaponic area. Aquaculture system will be removed to make way for more aquaponic grow beds. Installation of a compost heater to warm the water of the aquaponic system during Winter, keeping the fish actively feeding. Chicken pen to be moved to the opposite side of the yard for better access to sunlight during winter and renovated to include new access points. Include larger day yards for the chickens extending into Zone 2. Compost cages moved closer to source of materials i.e. chicken manure, green manure crops and pruning’s from Chinese elms. A self harvesting black soldier fly farm to be set up next to the chicken pen to provide extra protein to the chickens. The new wicking beds will be made using reclaimed building materials and soils from the existing beds. Due to the slope of the land and the need for wicking beds to be level, some beds will need to be placed on small terraces. Reclaimed materials from the existing hoop house will be utilised to build a new hoop house to cover these new beds. Shade cloth will be used through the hottest periods of Summer, and insect cloth to be used to exclude Queensland fruit fly in Summer and cabbage moth in Winter. Woodchips to be used as paths between the various beds, and once the materials are broken down it can be reclaimed as garden bed mulch. Wicking beds are chosen due to their water saving capability and their low maintenance of only needing to be watered periodically, saving time spent in the garden. A tap will also be plumbed into the hoop house to service the wicking beds and chicken pen. Ponds will be made out of 100L/27gal ½ barrels and tubs that are already on hand. It was required by the owners that any body of water is elevated from the ground to exclude cane toads from breeding in them. The barrels will contain native blue eye fish to feed on any mosquito larvae that may breed in them. Plant selected for the ponds are water chestnuts, azolla and duckweed. More ponds made from reclaimed wicking barrels may be installed at a later date for duck weed production for use as chicken, fish and compost worm feed. The existing Tahitian lime tree will be left in place and will have various other citrus such as; lemon, orange and mandarin grafted onto it, in an attempt to make a citrus “fruit salad” tree. The intension behind this is to allow different branches of the tree to be espaliered. The new pergola over the aquaponics will replace the existing hoop house. This will prevent overflowing of the system during heavy rain events. A small tank will be used to collect rainwater from the structure and the solid roof will also provide a place to mount solar panels to power some aspects of the system, such as the air compressors. from the night pen. These new day yards, with the inclusion of a “living greens” fodder feeder will flow into Zone 2. Discussions have been had in regards to installing a grey water treatment system. For now that improvement has been shelved until plumbing for renovations has been taken into account. Dwarf fruit trees including; mulberries, fig and papaya. Fruiting plants such as; pepinos, melons, pumpkins, squash, cucumber and cape gooseberry/ground cherry. Root/tuber crops including; sweet potato, QLD arrowroot and ginger family spices. Chop and drop green manure crops such as; pigeon pea, comfrey and field pea. Herbaceous culinary, medicinal and beneficial insect attractant plants such as; rosemary, tarragons, basils, nasturtiums, yarrow, marigolds, dill, lavender, chamomile, lemongrass, cumin, aloe vera, calendula and cloves. Zone 2 is situated at the back of the property and expands into the neighbouring yard to the NE. The neighbour allows grasses to be collected for the chickens and a number of “weed” Chinese elm trees to be coppiced for use in compost making. While the chicken pen itself is visited daily and is considered to be in Zone 1, the day pens are treated as being in Zone 2 as the plants located there only required attention every few weeks. 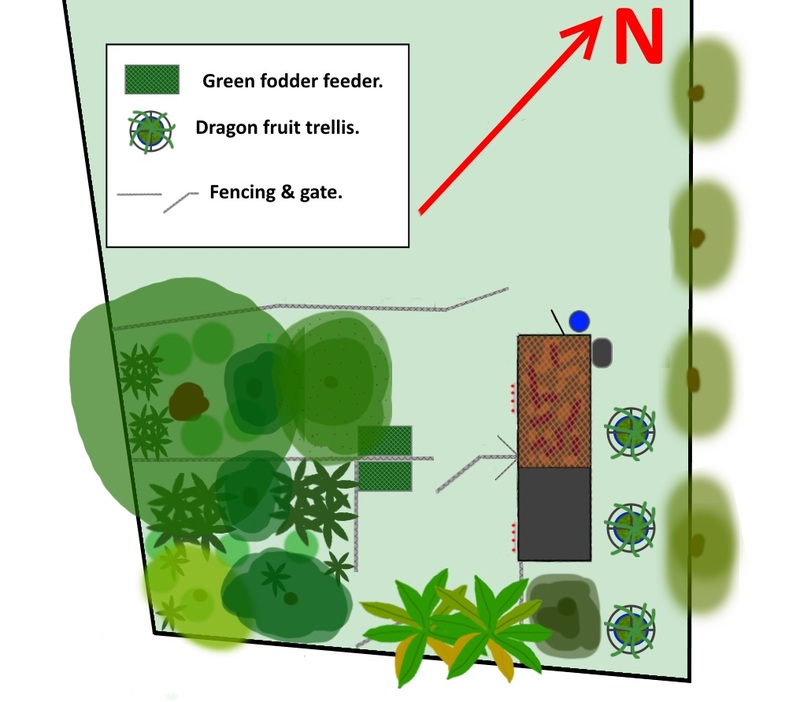 Following on from the Zone 1 chicken pen alterations, the “livings greens” fodder feeder is to be removed from inside the chicken pen and one will be installed into each of the day pens. This will allow them to have access to fresh growing greens without them scratching the plants out and extending the life of the food source. Other fodder and fruiting crops will be grown close to the fence lines, allowing the chooks grazing access without damaging and digging them up. These will reduce the need and reliance on purchased feed. the shitake mushroom logs & included food crops. Chop and drop crops have been included to reduce the movement of mulching materials through the yard. The plants in this zone will be stacked according to size. The finger lime and dragon fruits have been placed into this zone due to safety concerns for visiting children. The ice cream bean and Moringa will be used in the beginning as chop and drop crop, so may not be a permanent feature of this design. A native bee hive is being sourced and will be installed into this zone. The majority of the work will be carried out by the residents as time permits. Some help will come from friends and family that have the skill sets required to complete the tasks. Plans are yet to be drawn up for the major renovations to the house, therefore the works will commence in locations that will not directly affect the construction process to the house. Some tweaking has been done to this plan but nothing major so far. A few elements have already been removed like the chicken pen & fish farm. A hive of native Tetragonula Hockingsi bees has also been added with plans to add more in the future. Hope you've enjoyed the read folks. Cheers & all the best.